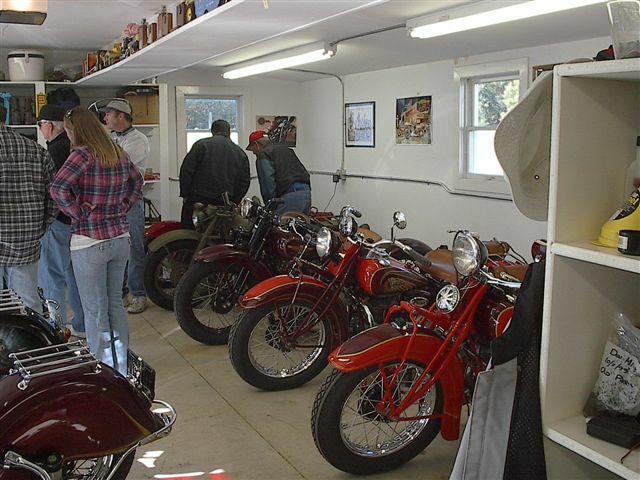 The October meeting was held at Jack Putnam's garage. The treasurer's report was given by Jack Putnam. We had a total of 14 members and guests present. The Old Car Festival at Greenfield Village was discussed by those who attended. The Model T Ford Club of Northwest Ohio was well represented. A Fall tour was being planned by Joe Bell for the weekend of October 20th and 21st. The tour is planned to go to Don Miller's in Fremont. Don is a gentleman who has Indian motorcycles. Jim Cook told us what is going on in the radiator world and Sue has sent out information for the 2008 Jamboree for some other club to sponsor. If no one steps up to the plate, our club will do it. Ray Sutton has some articles on today's new engine oils. There will be copies of the articles at the November meeting for anyone who wants them. Bruce Klepinger showed a tape of a Glidden Tour from the 1950's. The modern cars in the film are now antiques. Since our last meeting, Richard Wells from the Ohio River Valley T's called and said that their club would host the 2008 All Ohio Model T Jamboree with the help of the Southern Ohio Ford Club. It will be centered in Jackson, Ohio. Joe Bell and I would like to thank all of those who came up to the Tiffin Tour this year. We hope that everyone had a great time. The Don Miller farm will definitely be a stop on the Ohio Jamboree when our club hosts it in 2009. Don was an amazing host and the history of the property makes it a must see for a group of people who are somewhat interested in the history of the State of Ohio. As always, those that continued onto Wayne Coffman's had a great time. Dayton Wheels are everywhere at Jack's shop. These two sets are in the drying stage, hense the protective barrier. I'm not sure if these sets have destinations at this time. 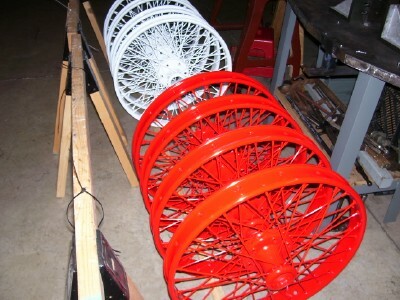 As is always the case, the important part of the wire wheel is the proper hub to attach it to the Model T. Many a wire wheel has been bought, only to later find that the matching hub was impossible to locate. A full set of four wheels and hubs is rare. This is an aluminum hogshead with newly reamed pedal shafts. Aluminum covers are known for leaking oil from the pedal shafts. 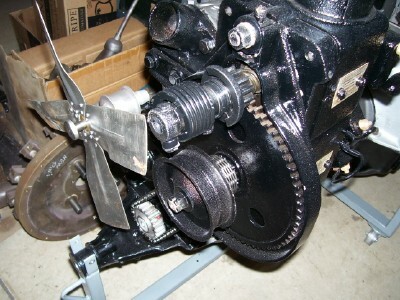 The traditional method of sealing the leaks involves o-rings and a groove in the axle shaft. 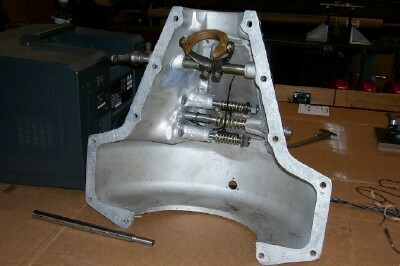 By machining the housing and using larger pedal shafts, the weakening of the shafts is averted. This front mount starter is just about ready to go. It just needs a belt to go to the fan pulley and it'll be all set. We're all interested to see how much noise this thing makes when it engages and idles. 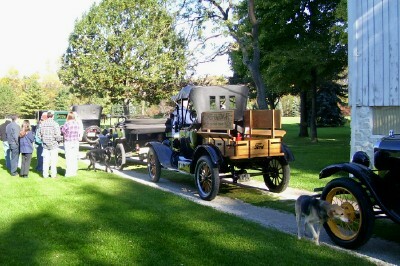 Don Miller's dogs check out the Model T's that have invaded their property for this morning in October. Don has a number of barns that we visited on the Fall Tour. The barns were filled with Indian motorcycles, antique cars, fire trucks, snow mobiles, and airplanes. The drive back to the property took us along the scenic Sandusky River. Many of the Bikes that are in the collection are restored prize winners. Some of them are barn fresh with mechanical improvements for safety's sake. Don was an Indian dealer in 1952 when the Indian company folded. Don went to work for a pipeline company to support his family and found that he could make a good living in the pipeline business. He has done pretty well for himself. Sue and I stopped by the on site home of Whitey Best and Joe Bell. 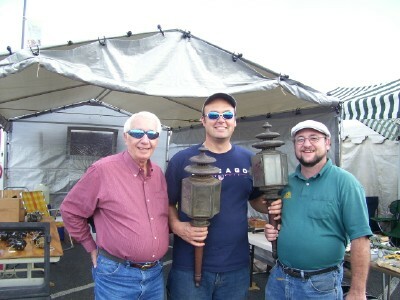 They tried to get me to buy their hearse lamps. I just didn't think they'd look right on Old Henry. I don't know if we ever did cover everything. It was walk for a while and sit to talk for a while. There are just so many friends to meet at Hershey. The days are full of smiles. Sorry for anyone that we missed along the way. 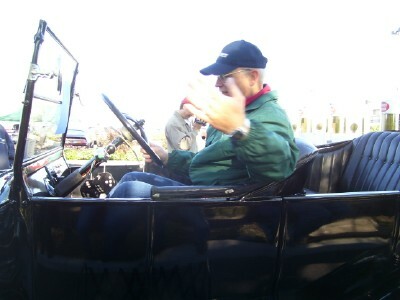 Tom Potter drives in the parade of cars headed into the AACA judging field on Saturday. It's not designed to be a parade, it just ends up that way. He offered us a ride and we foolishly refused because we wanted to watch all of the cars in action. An hour later we fought the crowds to get into the field of cars. 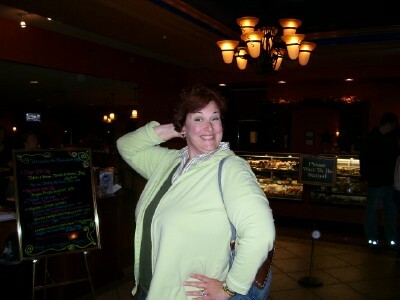 Our good friend Candy Wallace struts her stuff after supper on Thursday night. Twenty of our friends at Hershey all got together to share in a meal and compainionship. They are a great group. Candy will be so happy that I used this picture. She's lookin' good Brad!!! !